I love having a big tablet in a dedicated stand on my desk, and I love wireless charging. So I was excited to check out iPort’s Charge Case and Stand 2, which does what it says on the box. 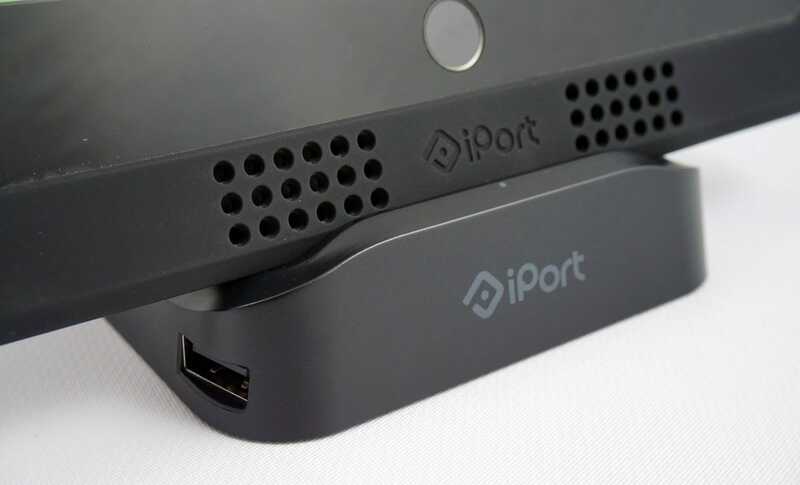 Technically the iPort design uses POGO plugs on its custom case and stand, so the charging isn’t wireless. But it achieves that easy set-it-down-pick-it-up motion that’s made Qi chargers so popular. $160—more for some iPad designs—is a lot to ask for, even considering you get both a stand and a charger in one package. But for the niche audience it serves, this is a great solution. It’s hard to fault Apple for keeping wireless charging restricted to the iPhone: putting it in the iPad would mean getting rid of its tough metal shell, and the ergonomics of cases and stands don’t really mesh well with Qi. 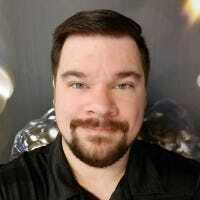 But I have fond memories of my HP TouchPad and Nexus 7, both tablets with wireless charging functionality, and I often wish I had something similar for my Pixel C, a constant desk companion. This iPort setup gives me a reason to make the switch. The case comes in two primary parts, which slide over either end of the iPad and click nicely together. It’s a bit thick—especially on the bottom, where the case requires a pass-through Lightning charger and a bit of extra space to let sound out through the bottom-firing speakers. But the soft-touch plastic feels nice in your hand, and adds only about three quarters of an inch to the iPad’s height. It feels more than capable of taking a few hits. Speaking of that pass-through port: you can take it out with a bit of effort, exposing the Lightning port for charging or data. 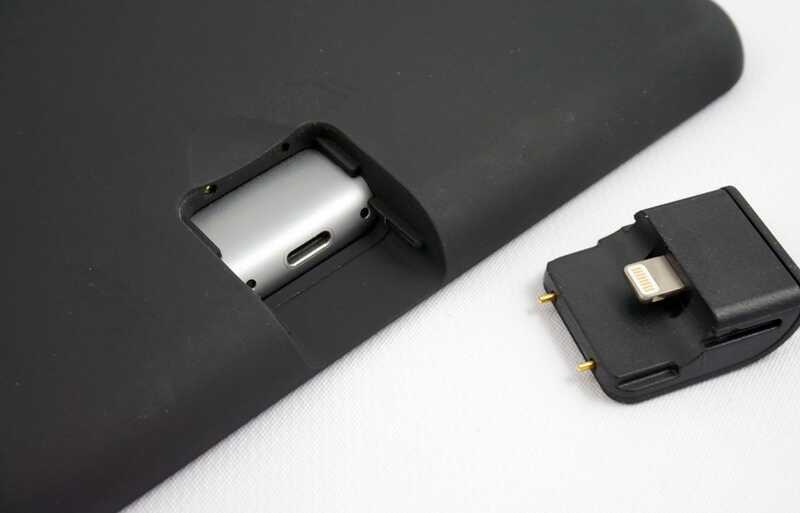 This is the one aspect of the design that’s less than elegant: I think iPort could have moved the POGO pins further apart and placed a permanent Lightning port on the exterior of the case. That would have meant one less part to lose, and no need to shove it in and out on the rare occasions when a cable connection is necessary. On the rear of the case are two sets of POGO pins: one for portrait and one for landscape. Set the iPad down in the dock, and it starts to charge. Magnets help make sure the case is secured in the correct spot. Simple. Easy. Appealing. Once the iPad is in place it charges at the maximum rate. There’s some thoughtful design that goes into the dock, too. 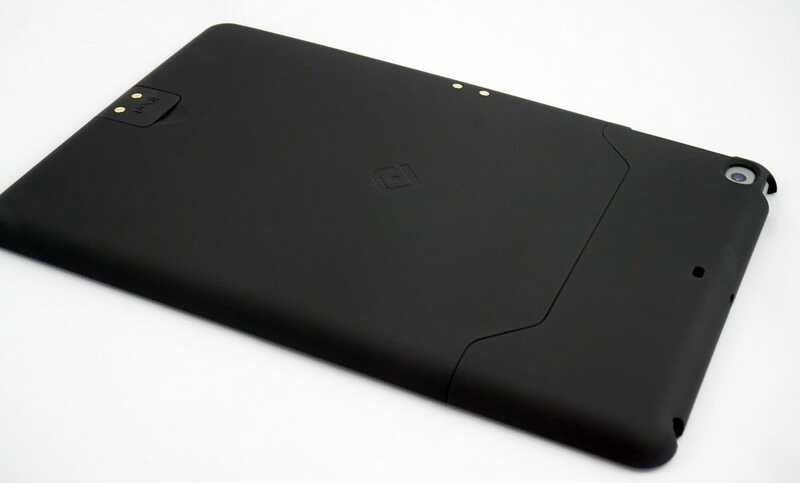 A subtle painted dot on the right side of the case lets you see where to rest the tablet, since the extended bottom edge makes it slightly asymmetrical. 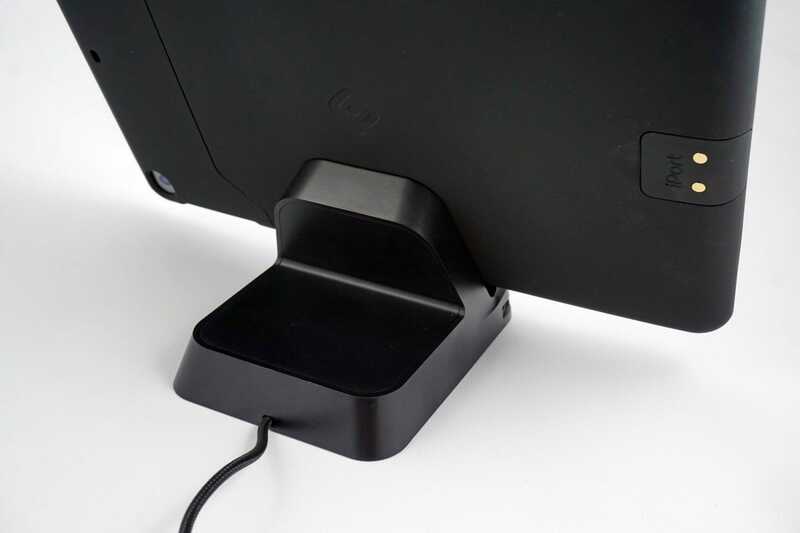 While the dock is for power only and the large brick can’t connect to your computer for data, it includes two handy USB ports on the dock itself for easily charging other devices at the same time. 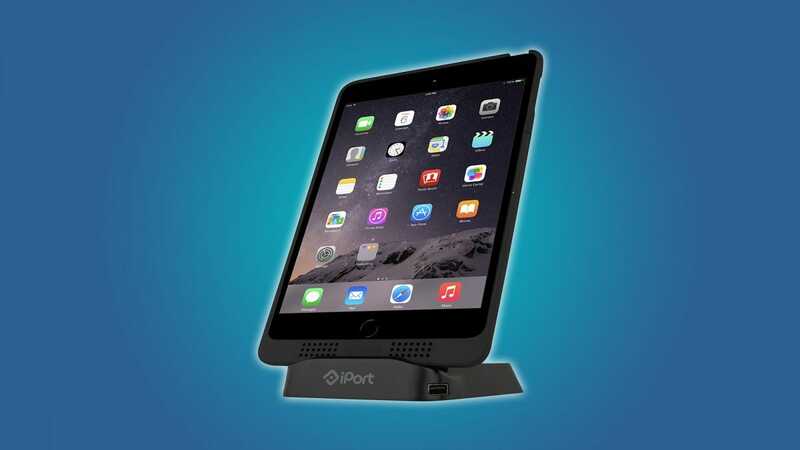 The dock is heavy and sturdy, with a rubberized base that doesn’t move around when you’re setting down or picking up the iPad. The angle isn’t adjustable, but the it should work for most desk and nightstand setups. You may need to make some adjustments if you want another base for your kitchen. I really enjoy the design of this combination case-dock. I know the appeal is limited—for the same price you could get a super-premium leather cover and a pretty good, non-charging stand. But if you like the convenience of never having to plug your tablet in, I think it’s worth the expense. 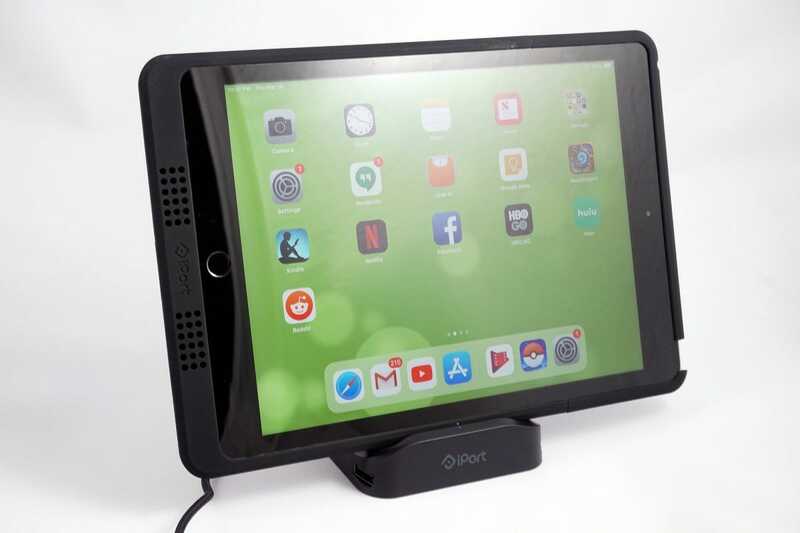 The Charge Case and Stand 2 is available in two sizes: one that fits the standard-sized iPad, Air, and Pro 9.7, and another for the various iPad Mini designs. If you need a more semi-permanent option for a POS application, check out iPort’s Luxeport designs. Why worry about carrying around a wallet and a phone? If you have your phone on you 24/7—and we certainly do—you might as well combine the two. With the right case or accessory you can cut down on the clutter in your pocket.